﻿ Using Stones for Personal Growth. Hematite: Clarity of Thought. Hematite is a heavy, solid, silvery black stone with a metallic luster. Like rust, it is composed of Iron Oxide, and leaves a red streak when rubbed against harder objects. The name comes from the Greek haimatites, meaning "bloodlike", because of the blood red color of its powder. Hematite is mined in England, Italy, Switzerland, USA, Mexico, Brazil and Australia. In the tombs of Egypt, mummies were usually provided with headrests made of hematite. Also, hematite may have had importance to the Pueblo Indians, as there are indications that it was worn with turquoise as an amulet. 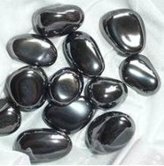 Hematite acts on the Inner Being to strengthen the ability to Think Clearly. Thinking clearly is using the information you have to draw accurate and realistic conclusions. It is the ability to reason realistically and accurately, to reason without distorting reality. It is the ability to think things through in a sound, logical, and reality-oriented way. And most important, it is the ability to reason without fooling yourself, that is, without rationalizing. The better you are at thinking clearly, the less you distort what is real, and the less likely you are to let your thinking be clouded by external forces such as emotions or the perceptions of others. The ability to think clearly is a powerful tool for helping you figure out how to get what you want out of life. It keeps you aware of the reality around you. It helps you recognize what is reasonable and makes the most sense. It gives you an awareness of what is realistic, and helps you see things as they are, without distortion. Clarity of thought consists of a doing side as well as a knowing side. The doing side is putting energy into drawing accurate and realistic conclusions from the information you have. The knowing side is recognizing what is realistic. These two aspects of thinking clearly form two sides of the same duality. This means that as you develop the ability to recognize what is realistic, you also increase the ability to draw conclusions that are based in reality. As a clear thinking person, you use all the information available to you whenever you need to draw accurate and realistic conclusions. You know that if you try to think something through without considering all the pertinent information, your thinking will be cloudy, incomplete and distorted, and will cause you to draw incorrect conclusions. Part of thinking clearly is being able to use a correct premise to draw a realistic conclusion. For example, suppose you have had a negative experience with someone from Ireland, and you later meet another person from Ireland. If you are not thinking clearly, you might choose a faulty premise for comparison and make the incorrect generalization that all people from Ireland will have a bad impact on you. You will then conclude that this person will also be bad for you, which is incorrect since the premise was incorrect. But if you are thinking clearly, you would not automatically segregate out people from Ireland, but take into account your experiences with all people. One of the major pitfalls to thinking clearly is rationalizing. Rationalizing is putting the cart before the horse by first looking for the outcome you want, and then making up a possible reason why things could be that way. This kind of bias keeps you from being open to all the possibilities, and makes you lose your clarity of thought. If you would like to enhance your clarity of thought, consider working on yourself in a couple of areas. Learn to think clearly about people by becoming a better judge of character. Work at reading people's intentions, their principles and ethics, and practice drawing accurate conclusions about who they are inside. Becoming a good judge of character not only helps keep you safe from people who would intentionally harm you, but it is also good practice in thinking clearly about people's motivations. Being open-minded also enhances clarity of thought. Work at being open to new ideas and concepts, no matter how strange they may sound to you at first. Practice evaluating whether particular outrageous sounding concepts are feasible. Speculate about things and contemplate possibilities. This will give you experience in reasoning without bias, in following a logical thought pattern wherever it goes, without demanding that it lead you in any particular direction. In order to be able to think clearly without being biased, it is necessary to be able to accept the possibility that something new and different might be true. To help you in learning to think more clearly, carry a small hematite stone with you. In addition to promoting clarity of thought, hematite is one of the "grounding" stones. A grounding stone is any stone that helps make you more reality-oriented, and pulls you closer to the physical reality you live and work in every day.